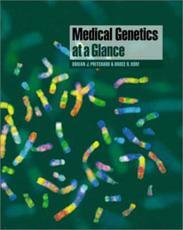 "Medical Genetics at a Glance" is a concise, well-illustrated and accessible genetics textbook. It follows the now familiar, easy-to-use, double page spread format of the "At a Glance" series. Each double page presents clear, memorable diagrams that illustrate essential information with accompanying text that covers key topics and issues in more detail. Structured into three distinct sections, "Medical Genetics at a Glance" takes the student through developmental biology, medical genetics and the clinical application of genetics. The first section focuses on basic biological concepts such as cell and chromosome structure, molecular biology and the cell cycle, as well as human embryonic development and sexual maturation. The second section applies these principles to medicine through the essential 'laws' of inheritance, the chromosome anomalies, multifactorial inheritance, normal polymorphism and gene frequency, then moving on to gene mapping, mutagenesis, cancer and immunogenetics. The final section addresses the clinical application of the above principles in pedigree drawing and molecular diagnostic procedures based on the human gene map, PCR and Southern techniques, risk assessment, genetic counselling, gene therapy and much more. "Medical Genetics at a Glance" is an ideal resource that fits the budget and reading time of medical students and those seeking a quick, thorough introduction to this fast moving field. It can be used as primary or supplementary reading in a lecture-based course and is perfect for exam preparation.